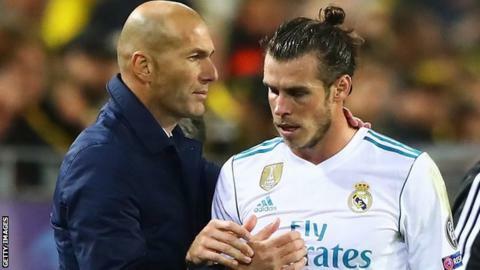 Real Madrid manager Zinedine Zidane has played down concerns about Gareth Bale's fitness before Wales' decisive World Cup qualifiers this month. Bale, 28, was left out of Real's squad for Sunday's win over Espanyol, five days before Wales visit Georgia. Zidane said his absence was a precautionary measure for a muscle strain, adding the 28-year-old would join the Wales squad on Monday. "He will travel with his international team," the Real boss said. "He could have played with us [against Espanyol] but I preferred to leave him out as he had a small complaint. "He's fine. After so many games at the start of the season and four months of injury, he was suffering after the game in Dortmund. "He strained his hamstring but in the end it's nothing. It's not an injury. I've spoken to him and the doctors." Bale capped a fine performance with a brilliant goal in last week's 3-1 Champions League win over Borussia Dortmund, but did not finish the game and has not taken a full part in training since due to the problem. The former Tottenham player is in the Wales squad for their upcoming World Cup qualifiers against Georgia in Tbilisi on Friday and then the Republic of Ireland in Cardiff on Monday, 9 October and linked up with the rest of the squad on Monday. Wales are second in Group D following wins over Austria and Moldova in September, but trail leaders Serbia by four points with two matches remaining. Second place could be enough to earn Chris Coleman's team a place in the play-offs, which will see eight of the nine runners-up in qualifying groups play for four remaining places in Russia 2018. Goalkeepers: Wayne Hennessey, Danny Ward, Chris Maxwell; Defenders: Ben Davies, James Chester, Neil Taylor, Chris Gunter, Tom Lockyer, Ashley Williams, Ethan Ampadu; Midfielders: Joe Allen, David Edwards, Andy King, Joe Ledley, Aaron Ramsey, Jonathan Williams, David Brooks; Forwards: Gareth Bale, Marley Watkins, Hal Robson-Kanu, Sam Vokes, Tom Lawrence, Ben Woodburn.